Many studies on the evolution of music concern the question of what defines music. Can birdsong, the song structure of humpback whales, a Thai elephant orchestra, or the interlocking duets of Gibbons be considered music? The answer is of course a simple ‘yes’. A definition of music can easily be stretched to include all types of sound, noises and even plain silence. As such it makes the discussion of what is and what is not music one of the most noticeable pitfalls in the study of music and evolution. An alternative is to separate between the notions of ‘music’ and ‘musicality’, with musicality as a natural, spontaneously developing trait based on and constrained by our cognitive system, and music as a social and cultural construct based on that very musicality. Of course this definition of musicality is still too general to be useful. The challenge is to define what precisely makes up this trait we call musicality. What are the cognitive mechanisms that are essential to perceive, make and appreciate music? Only when we have identified these fundamental mechanisms are we in a position to see how these might have evolved. In other words, the study of the evolution of music cognition is conditional on a characterization of the basic mechanisms that make up musicality. Furthermore, it is important to separate between the biological (or genetic) and cognitive (or functional) aspects that might contribute to musicality. While it is common to assume that there is a mapping between specific genotypes and specific cognitive traits, more and more studies show that genetically distantly related species can show similar cognitive skills; skills that more genetically closely related species fail to show. 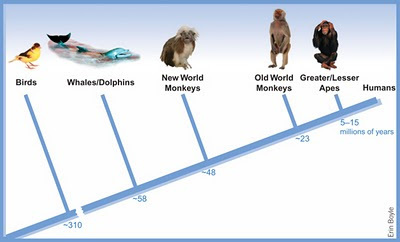 For example, more and more studies show that humans and certain bird species share their musicality up to a certain level, whereas humans and chimpanzees do not. Honing, H., & Ploeger, A. (submitted). Cognition and the evolution of music: pitfalls and prospects. Topics in Cognitive Science (TopiCS).